Inglenook Cottage is the epitome of a chocolate-box cottage, and has featured on postcards, in books and in the press. 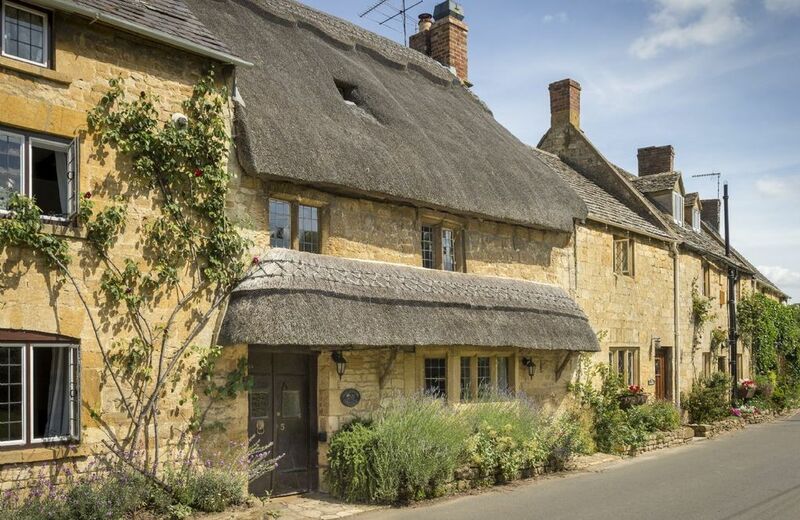 It's bursting with character and lies with many other thatched properties in the idyllic village of Broad Campden. 300 years old, the Grade II listed cottage used to be the village smithy, and it has a huge inglenook fireplace, complete with seat and bread oven where you can cosy up in front of a roaring log fire. There are countless exposed beams, a stone staircase and ancient wooden floorboards. The property is sympathetically restored with top quality modern appliances, a beautiful fitted wooden kitchen, and a cottage-style bathroom with shower. Inglenook fireplace with seat and bread oven. Some low ceilings and beams and uneven treads on the stone stairs (rope hand rail). Small, sheltered walled courtyard garden. One dog welcome (small additional charge). Todenham Manor Farm can deliver a box of fresh meat to your cottage for your stay. Please visit click here for more details. Character inglenook fireplace for open log fires with seat and bread oven. Gas hob and electric oven, microwave, dishwasher, fridge, freezer, washing machine, tumble dryer. Flat-screen TV, DVD, CD/radio/iPod dock. Picturesque Broad Campden has a village pub, The Bakers Arms, featured in the Good Beer Guide and the Good Pub Guide and serves excellent food. Several long distance paths, and many footpaths run through the village. The market town of Chipping Campden is just one mile away and boasts an excellent choice of pubs, bistros, restaurants and shops for guests to enjoy. Every year in late May the town hold the world famous Robert Dover's Olimpick Games. A must see is the shin kicking and tug o' war competition as well as many other sporting events. For something different experience Longborough's increasingly popular 6 week Festival Opera in June and July. Wander around Sezincote's magnificent gardens or Batsford Arboretum, Britain's most visited arboretum, particularly in the Autumn. Otherwise, there is the National Trust's Hidcote Gardens as well as Kiftsgate Gardens. Pretty cottage style bathroom with claw foot bath and shower. Gas central heating, character inglenook fireplace for open log fires with seat and bread oven. Gas hob and electric oven, microwave, dishwasher, fridge, freezer, washing machine, tumble dryer. Flat-screen TV, DVD, CD/radio/iPod dock. High speed fibre WiFi*. Travel cot, high chair and stairgate available on request. Garden furniture. *Please note that internet access is offered at this property for recreational purposes only and is not meant for business use. Speed/service may vary depending on the package obtained by the owner which is provided to guests free of charge. Should guests experience difficulties or loss of use, neither the owner nor Rural Retreats will be held responsible. We had a wonderful week in this beautiful Cotswold cottage. The owners have thoughtfully provided everything you could possibly need for a perfect stay. Fabulous location, a car is needed to reach the property but it is only minutes from Chipping Campden and surrounded by wonderful walks and places to visit. Comfortable bed, good shower (over bath), well equipped kitchen, amazing fireplace and logs for winter stays (we didn't try, unbroken sunshine) and bags of character. Petite courtyard garden scented with the most fragrant honeysuckle! Would recommend - thanks for a lovely holiday. We loved staying at this little cottage! Everything was clean and tidy. The welcome basket provided was most appreciated. The only improvement I can think of would be a room fan as the bedroom only has a small window to allow for any ventilation.